Are you wanting a new website, but not wanting to completely rebuild your existing one? A website redesign may be the perfect solution. Give your website the attention and care it needs with a fresh new look and appeal. Website Redesign help keep your site up to date with the latest design trends by updating key features of your website making it more mainstream, modern and clean. There’s no reason why you shouldn’t love your website. If it’s time to give it an updated look, our Website Redesign is the perfect solution. Businesses evolve, and what worked for your online presence a few years ago may now be out of date. Give your site the care and attention it deserves with updated fonts and colors. First impressions are everything, and our Website Redesign provides you with a website that is eye catching and easy to use. The time is now for a fresh new look that drives online traffic and brings in business. Website Redesigns are only available to clients whose current website was built by us. Works Great On Every Screen. Our professional responsive websites present beautifully not matter what device is being used. Quick Turnaround Time. There is less involvement necessary with a website redesign, therefore it can be completed within one to two weeks, depending on the updates needed. First Impressions Are Everything. A website redesign allows you to get a new look without having to get a completely new site. Custom Look at an Affordable Price. Each website redesign is tailored to meet, and exceed, your wants and needs. Optional Ongoing Website Maintenance by Those Who Built Your Site. We know how your sites works and what it takes to properly maintain it should an issue arise. *Website Redesigns are only available to clients whose current website was built by us. 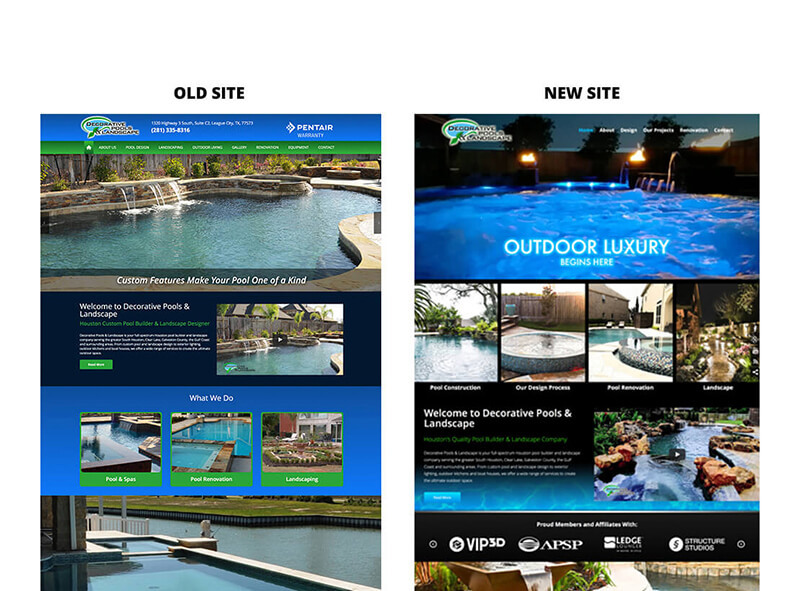 Decorative Pools, Inc. has built two websites with the Pool Marketing Site — one in 2012 and a new site in 2016. In 2018, they wanted a fresher look, but didn’t need to build an entire new website. Because they fit our requirements to be eligible for a website redesign, we recommended this to them. The process takes less time than building a new site, but can provide a new and improved look. Hear about their experience with the Pool Marketing Site. Cory Stanley and Brian Drury of Decorative Pools, Inc.